10 Fat-Loss Tips To Fuel Your Shred! Getting ready to kick off your summer shred? Get ripped with these 10 tips from the elite fitness athletes of Team Cellucor! With summer quickly approaching, the Season of Shred is upon us. Whether you've been slowly cutting all year or you're still working off some pounds from last year's holiday season, now is really the time to kick-start your weight-loss plans and put some fat-burning rubber to the road. To help you get a jump start, we've gathered the best fat-loss tips from the ripped athletes of Team Cellucor to help you lean out, gain definition, and look your best in the shortest time possible. If your immediate impulse is to jump on the treadmill to begin your cut, it's time to reconsider. When it comes to slimming down, most people overlook the strength component. "Don't skip the weights," advises powerlifter Karina Baymiller. "While cardio does have its place when it comes to fat loss, maintaining—and even increasing—your muscle mass through weight training can be even more beneficial." More muscle on your frame spells a faster resting metabolism, which will help you burn calories around the clock. Lifting also gives you an extra post-workout calorie burn that steady-state cardio just doesn't offer. In addition, lifting weights while cutting will actually help you spare muscle in a caloric deficit. To reiterate, don't ditch the iron for the treadmill just because it's time to burn. For strongman Colton Leonard, steady-state cardio definitely plays a role in dropping weight, but he prefers turning to high-intensity interval training (HIIT) for more effective fat loss. 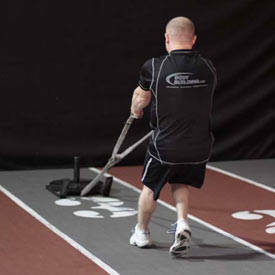 Leonard strays from "traditional equipment" and encourages people to change up the way they implement cardio. 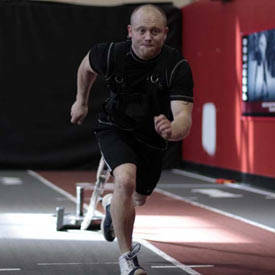 "Get off the treadmill and pull a sled," he says. 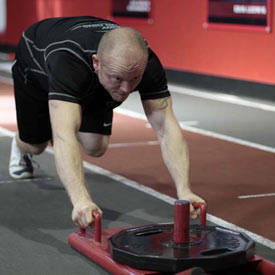 "To rapidly increase fat loss, sled work is one of the most effective tools in your arsenal." 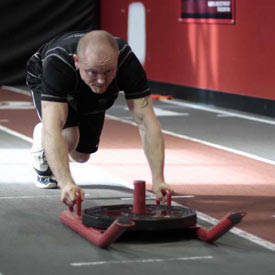 Crank up your cardio with this sample sled workout! When most people focus on designing a workout program, they focus heavily on the exercises they choose along with the reps and sets they perform. But don't neglect rest. Limiting your rest periods is a great way to crank up the fat-burning dial during any given workout session. "Try timing your rest or adding active rest periods by doing a cardio-based exercise between training sets," says IFBB pro physique competitor Craig Capurso. 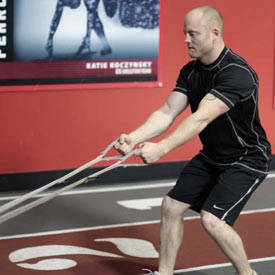 For example, you could jump rope or even perform jumping jacks between sets of bench press. 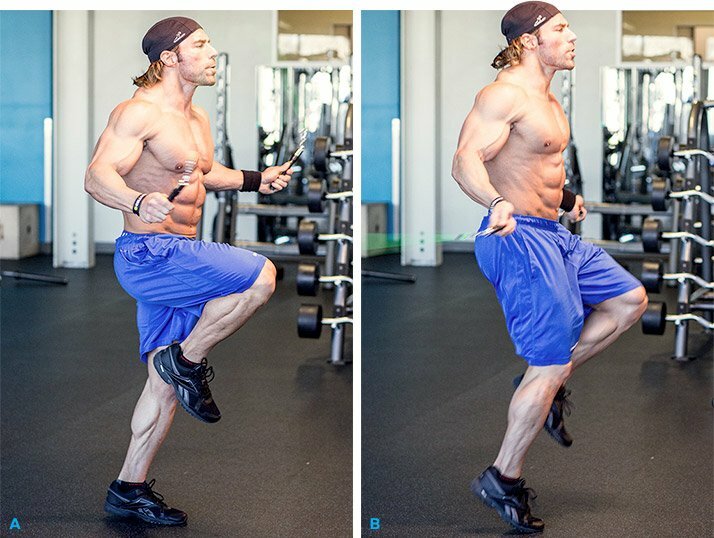 Filling your rest periods with plyometric exercises is a great way to burn fat faster. "Try timing your rest or adding active rest periods by doing a cardio-based exercise between training sets." Keep in mind that the shorter your rest periods are, the greater your post-workout calorie burn will be, but be sure not to drop rest (or active rest) from your workouts entirely. Cutting out rest completely will sap your strength and could hinder your form, which is a recipe for injury. When it comes to diet, you need precision to see success. "Be honest with yourself about your nutrition," says fitness pro Jen Jewell. "You might think you eat healthy, but if you can't seem to reach your goals, there's a good chance there are some calories you're taking in daily that aren't being accounted for." Jewell recommends using a calculator to figure out your calorie and macro needs, and tracking your daily intake in a food journal or with an app like MyFitnessPal. "Once you reach your goal weight, you'll have more flexibility, but if you really want to tap into your body's calorie-torching furnace and shed extra fat, paying close attention to the details is critical to your success," she says. Many people often don't realize how quickly their calories can add up. Drizzling just half a tablespoon of extra oil over your salad each day could mean you lose half a pound less than you expect over the course of a month, so make sure you're logging everything. To optimize fat loss, try to eat about 15-20 percent fewer calories than you are currently consuming. A 1-2 pound weight loss per week is not only practical, it's the most effective way to be successful with long-term weight goals. While it's easy to put all your fat-loss focus on nutrition and exercise, don't underestimate the importance of sleep. "Most people don't realize how much of an impact sleep—or lack thereof—has on not only their gym performance, but also on their body's ability to recover and lose fat," says Baymiller. If you're doing everything "right" but aren't seeing results, you should check your sleep habits. "Aim for 7-9 hours each night for optimal results," Baymiller advises. To help promote a deeper sleep, consider taking a hot bath before bed, turning down the temperature in your room, and making the last hour or two prior to sleep an electronics-free period. Supports Muscle Strength and Recovery and Promotes Deeper Sleep. Go Now! When it comes to losing fat, sugar can be a mighty enemy. "Take on a low-carb diet," suggests pro fitness model Calum von Moger. "Eliminate sugar as much as possible, and eat several small meals a day with lean meats, salads, and green vegetables." By eating frequent meals based on whole foods, you'll spur protein synthesis more frequently, help keep your blood sugar levels stabilized, and help your metabolism turn to stored body fat as a fuel source. Most importantly, with a higher protein intake (aim for at least 20-30 grams per meal) at regular intervals throughout the day, you'll preserve your lean mass. Lean meats, like chicken breast, ground turkey, and lean cuts of beef make for excellent protein choices. Opt to cook your foods in a healthy fat, such as coconut oil, or pair with a little avocado or handful of almonds to get additional heart-healthy benefits. It's no secret that supplements help boost your workout performance and ability to recover, but don't forget your nutrient needs as well. "Supplements are best utilized when nutrients are deficient from food, so look for products that help improve your energy while filling in any nutritional holes without adding many extra calories to your day," explains Capurso. Multivitamins can fill in micronutrient gaps, branched-chain amino acids (BCAAs) aid in muscle recovery, and protein powders help promote muscle growth and repair. These are great supplements to have on hand, especially on days when your nutrition falls short. A pre-workout, which will help you focus and get energized for tough training sessions, is another great supplement to have on a cut when your energy might be flagging. Perhaps the top complaint that Jewell hears regarding fat-loss workouts is being stuck in a rut and not seeing results. There's an easy solution: "Mix it up!" she says. 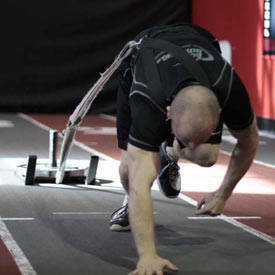 "If you're doing the same thing in the gym every time, day after day, your body will adapt to the workload quickly. You need to shock yourself and challenge your body in a new way." Jewell recommends switching up your workout program about every four weeks while looking for little ways to adjust your routine in between. "Try swapping out your dumbbells for kettlebells, or grab pre-loaded barbells for exercises where you'd normally use machines." For a killer fat-loss program that will help you cut in a hurry, try Craig Capurso's 30 Days Out program. This effective shredding plan includes a full nutrition guide, daily workouts, daily videos from Craig, and everything else you need to drop fat successfully—and keep it off. While a lot of your focus during a cut will be on your food intake, don't forget hydration. "Drink a lot of water," suggests von Moger. "Hydration can help curb hunger and may even boost your metabolism." How do you know if you're getting enough? He suggests looking at your urine color. If it's any brighter than pale lemonade, you need more H2O. Keep in mind that herbal and green tea can also be taken in replacement of water, as long as you don't add sugar or cream. Finally, don't lose sight of your end goal. "Stick to the program!" 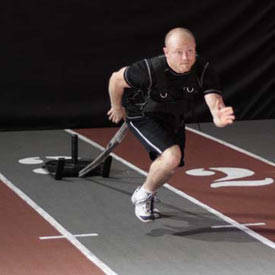 emphasizes strongman competitor Colton Leonard. "If you have done your homework and are following a good training plan, be patient and wait for results to come." Leonard says that too many people get discouraged right out of the gate and give up on a perfectly good workout program. "You didn't gain weight overnight, so you aren't going to lose it overnight either." With a proper plan, the right attitude, and a high level of motivation, you can see the success you desire. Don't jump from plan to plan, wildly altering your diet and training, every single week. Trust the process, take progress photos, implement the simple advice in this article, and get ready to have fun in the summer sun! Deliver a pure protein that packs more protein, and better flavors, into each and every scoop. Go Now!